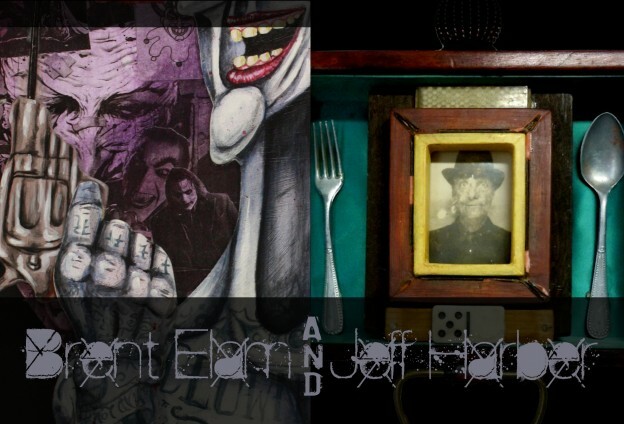 From June 29 – July 29, NX Gallery, an annex to CS Gallery in Olde Towne East, will play host to a collaboration exhibit featuring new works by mixed media artist Brent Elam and assemblage artist Jeff Harber. The exhibit’s personality reflects the whims of two visual mad scientists showcasing both their individual and partnered works. Saturated in irony and social satire the walls are filled with characters, creations, and charismatic paintings/assemblages that demand exploration. “Remnants” demonstrates how two artists with similar conceptual ideas meld two very different forms of art-making into an amazing collaborative experience. Elam’s paintings and sculptures incorporate toys, comics, and sci-fi movies from his childhood into whimsical and sometimes cynical low brow artworks dripping with Pop Surrealism. Harber’s assemblages give new purpose and meaning to things that are broken, out-lived their original value, or been forgotten over time; and breathes new life to things which are dead.